By Arden Moore, a dog and cat behavior expert and author of 26 best-selling pet books. She hosts the Oh Behave Show on Pet Life Radio and is a writer for Pets Best Pet Insurance, a dog insurance and cat insurance agency. Lon Hodge is a Vietnam veteran who was paired with a service dog named Gander, a Labradoodle. Gander was rescued from a kill shelter and is a recipient of the American Kennel Club Humane Fund Award for Canine Excellence. Hodge copes with autoimmune arthritis as well as Post Traumatic Stress Disorder and anxiety. Hodge said his world has changed for the better after being paired with Gander, who was trained by the Freedom Services Dogs of America. Together, they travel across the country to visit people at military hospitals, schools, pet expos, and other places. “He [Gander] literally saved my life. My heart rate was 120 beats per minute average for two years…It is not about 80. I was having night terrors and panic attacks daily and had to take addicting medication to stop symptoms. Life is 100% better with Gander in it,” says Hodge. Hodge kindly asks those who see him and Gander to not rush up and attempt to pet Gander when he is sporting his service vest. Hodge enjoys teaching people about service dogs and welcomes interactions with Gander – when politely asked first and when it is safe to do so. You can read more about Hodge and Gander’s story at veterantraveler.com. Read this article for tips on how to greet a working service dog. 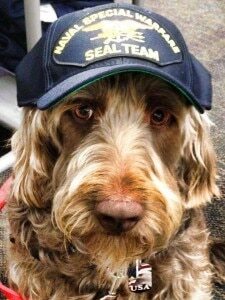 Photo of Gander from veterantraveler.com.